Lucozade Ribena Suntory has announced that all Lucozade Sport bottles distributed on course at races and sport events will be made from 100 per cent recycled plastic (rPET). Runners in this month’s Virgin Money London Marathon will be the first to drink Lucozade Sport from fully recycled plastic bottles. The use of rPET to make these 380ml bottles, which are manufactured specifically for sampling at events, will prevent approximately 7.8 tonnes of new plastic being produced every year. In another significant breakthrough, Lucozade Ribena Suntory and London Marathon Events will be operating a closed-loop recycling initiative that will see all plastic bottles on the course in Tower Hamlets, Greenwich, Southwark and Canary Wharf collected, before Lucozade Ribena Suntory then recycles this plastic back into bottles. The manufacturer will also give out 30,000 Lucozade Sport Ooho seaweed capsules. 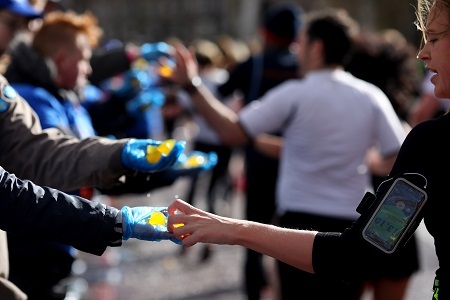 This will be the largest Ooho trial run by Lucozade Ribena Suntory at a mass-participation sporting event since the Lucozade Sport brand owner began using the material to limit plastic on course last year. Additionally, following a successful trial last year, three of the Lucozade Sport stations on the course of the Virgin Money London Marathon will feature compostable cups. The use of these cups - which will be collected and then composted at a plant in Bedford - will reduce the number of Lucozade Sport bottles across these water stations by 85 per cent. Michelle Norman, director of external affairs and sustainability at Lucozade Ribena Suntory, said: “We are proud to say that all 380ml Lucozade Sport bottles distributed on course at mass-participation sporting events from now on will be made from 100 per cent recycled plastic. Over ten years ago, Ribena - another brand in the Lucozade Ribena Suntory portfolio- became the first soft drink brand to use 100 per cent recycled plastic to produce their bottles. Last week, the manufacturer announced that a redesign has already begun on Ribena to ensure its bottles are fully compatible with the UK’s current recycling technology. Design work will follow across the Lucozade Sport and Lucozade Energy brands. As a founding signatory of the WRAP Plastics Pact, the manufacturer has pledged to make 100 per cent of its packaging reusable, recyclable or compostable by 2025.